This product is a deck-plan of the Type M Subsidized Merchant “HIMS The Pretty Penny” from Scrying Eye Games. You can also get an air/raft in the same style for free. The scale is 25 mm/square. The side of a square is 5 ft. This fits a number of counters, card board heroes and miniatures nicely. But it doesn’t match the classic scale exactly (but close enough). It also makes the deck-plan of the ship quite large. The ship is fitted within 19 pages that you have to assemble yourself. It would have been nice if there was a hi-res image-file includes as well, so you could print it out on a large printer/plotter. The need for deck-plans has always been there. In my group, and in other groups that I have played in, we have always used deck-plans. Even though there might not be any combat within the ship, it is always nice to see where your character lives and works. If there is combat within the ship, a deck-plan is a must. Combat can be solved using standard traveller rules, or using special on-board rules like Snapshot. Even though this is a very nice product, I will not use it. The reason for this is that my group is quite tainted by what the March Harrier from the Traveller Adventure looked like. The March Harrier is a type R. (The classic type M is a 600-ton Subsidized Liner.) There are a number of elevators in this ship. Where is the Launch? This is not the same ship. It doesn’t match the March Harrier. 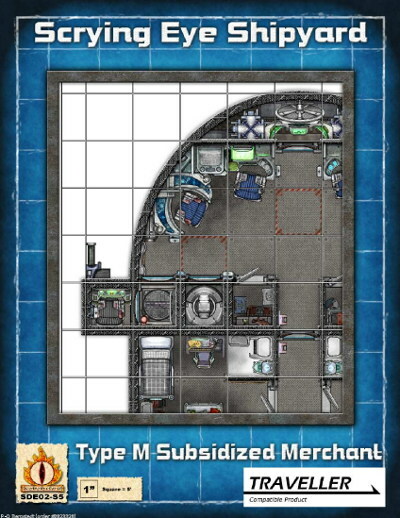 But for a new group it would probably be very nice to have this pretty deck-plan on their gaming table. This is what I think a classic type R should look like. They did stick to the classic designs with the Scout and the Free Trader (also now availale). We’ll have several more of these over the next few months, including a few new designs. I am looking forward to seeing your new products.